H Ward and W Roberts, Romney, London 1904, vol. II, p.3, illus. Elizabeth Burgoyne was the daughter of Eliab Harvey of Claybury Hall, Essex, and his wife Mary Benyon, who were married in November 1756. Her date of birth remains unconfirmed (although one source puts it in 1761, which would make her three years younger than her cousin Admiral Eliab Harvey, who commanded the Temeraire at the Battle of Trafalgar). In October 1780 Elizabeth married the thirty-year-old Montagu Burgoyne, the younger son of Sir Richard Burgoyne, 6th Baronet, of Sutton, Bedfordshire. He made his living from the sinecure crown office of Chamberlain of the Till Office in the Exchequer, which had been given to him in 1772 by his cousin, the Prime Minister, Lord North, and he was an old client of Romney’s. He had sat to him for a head and shoulders portrait as early as May 1776, and at the beginning of 1779 had commissioned a second head and shoulders, on which work had proceeded in casual fashion up till the time of his marriage. Once the honeymoon was out of the way, it was predictable that Burgoyne would decide to commission a likeness of his new wife as a pendant for the second of his own portraits, then still unfinished in Romney’s studio. During the course of 1781 Mrs Burgoyne gave Romney seventeen sittings. They fell into two clusters: ten between late January and April, and a further seven in a short period between 27 November and 13 December. For a portrait that seems to inhabit a world of relaxed spontaneity the number of sittings is a puzzle. The picture looks as if it is the product of about two. There was clearly something elusive about the flighty Mrs Burgoyne (she cancelled a further seven appointments with the artist) that it took Romney a long while to capture satisfactorily, and many of the early sittings may have turned into chat sessions. The genial Mr Burgoyne himself, whose own portrait was proceeding desultorily at the same time, kept a watching brief on the commission and seems to have developed genuinely friendly feelings towards the artist (he later bought Romney’s imposing Lady Hamilton as St Cecilia to hang in the couple’s new home of Mark Hall, near present-day Harlow). Husband and wife were fabled for their affection for each other, and are said to have been put forward as candidates for the Dunmow Flitch of Bacon – an ancient Essex ceremony celebrating a happily married couple. Their geniality extended to telling their relatives about Romney: Mrs Burgoyne’s aunt Hannah Benyon (wife of her half-uncle Richard Benyon of neighbouring Gidea Hall) began sitting to Romney a month after her niece, and Montagu Burgoyne’s elder brother John became a client the following year. Mrs Burgoyne’s first pregnancy was evidently what brought the sittings to a halt at the end of April and when in November, now as the proud mother of a baby daughter, she was ready to resume, Romney may well have detected a fundamental change of character and decided to begin the portrait afresh. He probably felt that a short, intensive campaign was the only way to get the picture done, in coup de foudre mode. The finished work is the very epitome of Romney’s aesthetic of the studiedly informal, perfected in the few years after his return from Italy in 1775 and which had caught the taste of the town. The colour scheme is simple and restrained, a harmonious mix of white, pale blue and russet-brown, the olive-green of the trees at the side providing subtle offbeat accents. The design is understated but sophisticated: the shadowy plinth at the side provides a rectilinear underpinning against which the diagonal accents of the arms, the folds of the dress, the shadows and the clouds direct the eye to the focal area of the picture where the story of the future of the family is taking shape: the central area between the two white loops and the two blue waistbands, the shaping of the lower of which discreetly reinforces the message. The surface of the canvas is freely brushed throughout, the strokes sitting alongside each other and blending with an apparent effortlessness that offsets the edgy control of the figure’s outline. 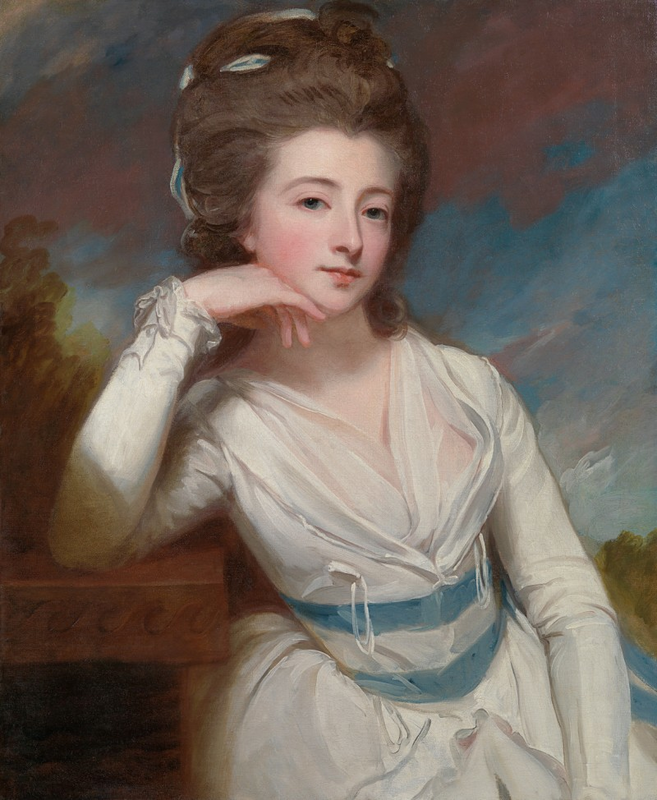 The Burgoynes have declined the overt classicism that Romney offered in many of his female portraits of the late 1770s and early 1780s through the use of pose, costume or background prop – Mrs Burgoyne’s white gown, alluding to her recent marriage, is visibly a contemporary fashion item, not a Grecian robe; yet the heart of Romney’s neo-classicism was not the introduction of classical ‘signposts’ but its instinct for sheer formal elegance and reductiveness, and that is unmistakeable here. Mr Burgoyne paid for the portrait, together with the pendant of himself, in November 1782. In 1785 – the year of the St Cecilia – Romney’s account book records an outstanding payment for a replica of Mrs Burgoyne and it is probable (since four canvases duly came down to posterity) that second versions of both portraits were made by Romney shortly after the first ones even if no further documentation for the commission survives. The Burgoynes were to have four children altogether and they outlived them all, so that the four pictures passed to Edward Algernon Blackett, the son of their first daughter, Elizabeth. He bequeathed one pair to his son Edward Umfreville Blackett and the other pair passed to his second wife Alicia, who lived until 1927. The present canvas is Alicia’s Mrs Burgoyne and it has every appearance of being the original. George Romney ranks with Reynolds and Gainsborough as one of the finest society portrait painters of the eighteenth century. The son of a cabinetmaker, he was apprenticed first to his father and then in 1755 to the itinerant portrait painter Christopher Steele. In 1757 Romney set up a portrait practice in Kendal. In 1762 Romney left his wife and family in Kendal and moved to London to seek his fortune. He specialised in portraits and historical pictures such as The Death of General Wolfe, shown at the Society of Arts in 1763. The following year he visited Paris, but was dismissive of modern French art. Romney’s society portraits of 1764-73 show a grandeur of treatment and a graceful, elongated neoclassical style. Romney went to Rome in 1773 with the miniature painter Ozias Humphry, in order to study Italian art, particularly the work of Michelangelo and Raphael. Although he had a reputation for reclusiveness, Romney’s broadly-brushed pen and ink drawings of dramatic figural scenes have affinity with the work of Abildgaard, Sergel, Joseph Wright of Derby and other members of the Fuseli circle in Rome. Romney returned to England via Florence, Bologna, Ferrara, Venice and Parma in 1775. He took a lease on Francis Cotes’s grand house at 24 Cavendish Square and quickly re-established his portrait practice. His sitter books record some 1500 sitters between 1776 and 1795; he excelled at painting beautiful and glamorous society women, their elegant poses informed by the study of Italian art. Romney hankered after success as a history painter and produced a painting of The Tempest for Boydell’s Shakespeare Gallery in 1790, as well as his many portraits of Emma Hamilton (then Emma Hart) in allegorical or classical guise. These portraits of Emma are a perfect fusion of Emma’s theatrical instinct with Romney’s Romantic bravura brushwork; his love for her was not requited. Visiting Revolutionary France in 1790, Romney admired a flourishing school of history painting in the work of David and other neoclassical artists. His instinct to express himself as a history painter found vent in numerous dashing, emotionally charged drawings, including many on subjects from Milton, but in few large history paintings. In 1798 Romney moved to a new large house and studio in Hampstead, but soon after suffered a series of strokes. The following year he moved back to his long-neglected wife in Kendal and died there in 1802. He was a melancholy, sensitive man, who triumphed in his chosen sphere of portraiture but always longed for recognition in the so-called ‘higher’ category of history painting. His friend Flaxman wrote of him: ‘his heart and soul were engaged in the pursuit of historical and ideal painting’, but his stunning portraits are among the most impressive of his century. The work of George Romney is represented in the National Portrait Gallery and the Tate Gallery, London; the Museum of Fine Arts, Boston and the Huntington Art Gallery, San Marino, California. The incorrect provenance for no.180a is corrected in this essay.